The use of iodinated contrast material with MDCT is pivotal to the detection and characterization of a wide variety of vascular and parenchymal abnormalities. Optimization of contrast media techniques is important for diagnosing these abnormalities. This webcast will discuss many of the keys principles of contrast media utilization, focusing on the impact of the dose, concentration and rate of administration on the arterial phase and the venous phase, with an eye towards individual patient customization. We will also discuss new information gained from software that monitors the contrast media injection, which may help improve the safety of administration. Describe the principals of vascular and parenchymal enhancement with iodinated contrast media during both the arterial and venous phases. List at least two techniques which have contributed to progress in contrast media personalization. Identify three potential improvements noted in the NEXO software program designed to improve CT utilization. This is the first article in a 4-part series discussing the use of macrocyclic gadolinium-based contrast agents (GBCAs) in magnetic resonance imaging. The goal is to provide an over-view of key considerations when evaluating the efficacy of a contrast agent and to provide a review of key studies related to the evaluation and use of specific contrast agents. 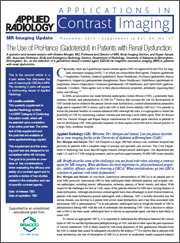 Describe both long-term and short-term risks for the patient related to the use of contrast agents. Define the key considerations when evaluating the efficacy of a contrast agent. Discuss the potential patient risk factors for NSF with various contrast agents. 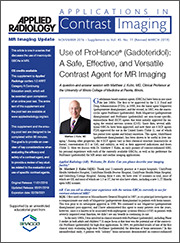 Compare and contrast the benefits and cautions of specific contrast agents. 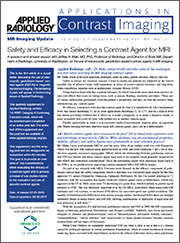 List the steps recommended for evaluation of a new contrast agent and possible reactions. Review key studies related to the evaluation and use of specific contrast agents. This Program Has Been Supported Through An Unrestricted Educational Grant from Bracco Diagnostics Inc.
A question-and-answer session with Desiree Morgan, MD, Professor and Director of MRI, Body Imaging Section, and Rupan Sanyal, MD, Associate Professor, Body and Emergency Radiology Section, Department of Radiology, University of Alabama at Birmingham, Birmingham, AL, on the selection of a gadolinium-based contrast agent (GBCA) for magnetic resonance imaging (MRI) in patients with renal dysfunction. This program was originally presented live at RSNA 2017 and sponsored by the Institute for Advanced Medical Education (IAME) and supported through an unrestricted educational grant from Canon Medical Systems. Faculty: Gregg R. Cretella, Steven Don, MD, Robert MacDougall, M.Sc. This Expert Forum will update the audience on recently published FDA guidance and the ongoing work of the Image Gently Alliance and the American Association of Physicists in Medicine (AAPM), which continue to refine the safety and effectiveness of pediatric X-ray imaging. Articulate the benefits of facility awareness in the Image Gently Alliance and the ACR Dose Index Registry. Evaluate the readiness of your radiology department to better serve the pediatric population. Develop a strategy to use the appropriate dose for pediatric patients while optimizing diagnostic quality. Correlate the recent advances in exposure surveillance and DR technologies to the improvements in pediatric patient comfort, safety and imaging outcomes. Supported through an unrestricted educational grant from FUJIFILM Medical Systems U.S.A., Inc. This program was originally broadcast live as part of a webinar supported through an unrestricted educational grant from Philips Healthcare. Since the 1990’s, multi-patient contrast administration has been available in the form of the Pharmacy Bulk Package (PBP), which is still offered by several contrast vendors. The FDA required that all related Prescribing Information (PI) sheets for the PBP include specific directions for the dispensing of the contrast from the PBP container. The PI language describes withdrawing the contrast from the bottle in a suitable work area, specifically “a laminar flow hood, using aseptic techniques”. However, this method is not possible in most CT Suites, as laminar flow hoods are generally located in the Pharmacy, not the CT suite. Therefore, during the last decade, regulators have begun to have concerns about the use of PBP. In 2009, The Joint Commission began citing imaging providers who were using PBP to fill power injector syringes in what they considered an unsuitable work area, as described in the manufacturer’s PBP guidelines for the dispensing of contrast. This Expert Forum will review the steps taken by the contrast media industry and the FDA to develop a safe and compliant solution for multi-patent contrast administration in CT. This solution is now available as the Imaging Bulk Package (IBP) which is approved for use in the CT Suite. This panel will also share their comprehensive process for incorporating IBP into their clinical practice. Utilizing the latest advances in digital mammography and medical informatics can help to maximize financial, operational and clinical outcomes. Given the growing popularity of Digital Breast Tomosynthesis (DBT) and the large datasets that it produces, this webcast will also help attendees to evaluate the readiness of their current IT infrastructure, and make sound decisions when considering the purchase of new breast imaging technologies. Translate the recent advances in FFDM and DBT technologies to the improvements in the early detection of breast cancer. Translate the recent advances in FFDM and DBT technologies to the improvements in patient comfort and satisfaction. Evaluate your IT infrastructure's ability to support new FFDM and DBT imaging systems. Articulate the benefits of FFDM and DBT advances to your existing/potential patient population. This article is 1 in a series that discusses the use of macrocyclic GBCAs in MRI. A question-and-answer session with Matthew J. Kuhn, MD, Clinical Professor at the University of Illinois College Of Medicine at Peoria, Illinois. Describe the currently-available, FDA-approved, gadolinium-based contrast agents (GBCAs) and their main distinguishing properties. Understand the evidence supporting the excellent safety profile of the macrocyclic GBCA ProHance (gadoteridol). Summarize the literature comparing ProHance (gadoteridol) to other GBCAs, including the 1M agent Gadavist (gadobutrol; ie, the TRUTH study). Explain how the macrocyclic GBCA ProHance (gadoteridol) provides versatility in a number of clinical setting.